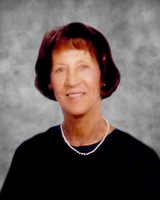 Provide comfort for the family of Verdella Mahood with a meaningful gesture of sympathy. Verdella Frances Mahood (nee Stepan) of Kincardine, passed away peacefully at Pinecrest Manor, on Sunday, February 3, 2019 in her 98th year. Beloved wife of the late Jack Mahood (1976) and special partner of the late Alfred Emery (2005). Cherished mother of Della (Fred) Mahood Ryder, Delores (Todd) Porter, Peggy Mahood and Patsy (Larry) Yule of Kincardine. Lovingly remembered by her grandchildren Gray, Jackie, Megan, Duncan, Wesley, Bryan, Katie and Peter and her 15 great-grandchildren. Predeceased by her parents Matt and Lulu Stepan; siblings Gem Trudgeon, Patsy Johnston, Lulu Atkinson, Delores Howley and Vincent Stepan; brother-in-laws Ted Trudgeon and Harold J. Atkinson. Survived by sister Alfreda Althius; brother-in-laws Bob Johnston, Pat Howley and Emmanuel Althuis. Fondly remembered by the Mahood family by many nieces, nephews. Visitation will be held at the Davey-Linklater Funeral Home, Kincardine, on Saturday February 9th, 2019 from 12:30 p.m. to 1:45 p.m.. The funeral service to celebrate Verdella’s life will follow at 2:00 p.m. with Rev. Kathy Fraser officiating. Donations to the Royal Canadian Legion Br.183 (Poppy Fund), Knox Presbyterian Church,Kincardine or a charity of your choice would be appreciated as expression of sympathy. To send flowers in memory of Verdella Frances Mahood (Stepan), please visit our Heartfelt Sympathies Store. Donations are being accepted for: Royal Canadian Legion, MacDonald Branch 183 (Ontario) BranchPoppy Fund. We encourage you to share your most beloved memories of Verdella here, so that the family and other loved ones can always see it. You can upload cherished photographs, or share your favorite stories, and can even comment on those shared by others. Provide comfort for the family of Verdella Frances Mahood (Stepan) by sending flowers. Dear Della, Delores, Patsy and Peggy, I am thinking of you and your families as you remember your Mom.Many times, as kids, we played around your neighbourhood and the high school. Your Mom and Dad were always very tolerant of all of our noise and childhood pranks.I also remember having conversations and getting some good advice from both of them.